3) Shot Depth or Distance from front of the rim. All of the fundamental teaching and practicing that we do as coaches regarding hand position and body alignment help our players shoot the ball straight. I measure it visually by seeing where the ball lands on the rim, or by having players shoot the ball on the various lines in the gym and see if it lands straight on that line. The great thing about shot line is everyone can see it. The Player and Coach can see clearly if the shot misses to the left or right. Like everyone else, we work on generating the force necessary to get the ball to the hoop –no offhand interference, bending knees, and flexing the wrist to generate the necessary force to get the ball to the basket consistently. What I don’t feel that I have been as detailed about is the arc that our players shoot at. Recently, I have found research data shows us that there are optimal angles. My evaluations consisted of too flat or too high. Everyone knows when the ball is shot too flat, it gives the ball less area within the basket to score and this hurts your shooting percentage. However, most people don’t understand that an arc that is too high hurts your shooting percentage just as much as shooting too flat. When a player shoots too high, they effectively lose control of the ball and begin missing short and long. Also, when the ball is shot too high it comes into the rim at a greater velocity making the shot less soft and getting less friendly bounces. I have learned that a very important piece of the puzzle to understand when trying to work with a player on arc is that they can’t see their own shot. As pointed out above, when missing L or R the player can clearly see they are not shooting the ball straight. However, when it comes to arc the player has no idea how high they shoot the ball. Anyone that is watching the shot can see the arc very well, but the player shooting the ball cannot. A player should never watch the ball and should be focused on the target, but even if they did they would just see the ball go up in a line and down in a line, having no idea how high it actually went. For over a decade, Noah Basketball has been conducting studies with the goal of finding the perfect angle and depth inside the rim for a shot to travel. 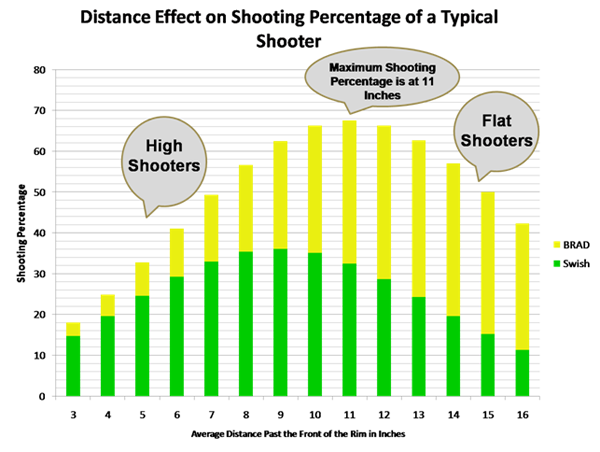 In addition to learning something about the perfect shooting arc, I also learned something about proper distance (shot depth) for the shot from their research. That is that a perfect shot travels 11 inches beyond the front of the rim, which is 2 inches past the center. 45 degrees is the optimal arc. 11 inches past the front of the rim is the perfect shot depth. Every great shooter shoots the ball deep in the basket. The best shooters don’t always swish the ball–they often hit the back of the rim. Noah calls this a BRAD shot, which stands for Back Rim And Down. The best shooters only vary only plus or minus two degrees on shot arc – Building the muscle memory to consistently repeat the shot is critical to great shooting. High-arcing shooters generally are short when they miss while line-drive shooters skew toward being too long on their shots. The Noah team developed a machine that enables a player to shoot the correct arc and shot depth. It does this by providing immediate feedback. When a player shoots the machine will immediately tell them the arc or distance of the last shot. Since a player can’t see their own shot, this objective, immediate feedback leads to rapid learning. Noah Basketball will do a FREE, no obligation shooting clinic in your gym, with your players. During the clinic all players will have their shot evaluated by the Noah System and then a formal presentation will be given that explains the science of the basketball shot. Click here for more details about the free clinic or call 1-888-TRY-NOAH. During the clinic, players will understand all the principles outlined above for the first time. I have spoken to several coaches that have hosted one of the free clinics and they say it is well worth the time. When a player shoots on a Noah, the Noah will announce the exact arc that the ball was shot with. After a few repetitions, the player can begin to get a feel for what a 45 degree shot release feels like, and what the release feels like when the arc is too flat or too high. In addition to hearing the arc, the arc and the depth of the shot are captured on a laptop computer so that the player and coach can review the data at the end of their workout. And they now have a product that allows you to capture all this data on your iPad, iPhone, or Ipod Touch. Here is a link to an article about the success that Dwyane Wade and the Miami Heat have had with Noah. For those of you that want to dig into a little more detail, below are some really interesting charts provided by Noah Basketball that explain some of the details I outlined above. These charts are also a part of their clinic presentations. About the best a player can control the arc of the shot is plus or minus 2 degrees. 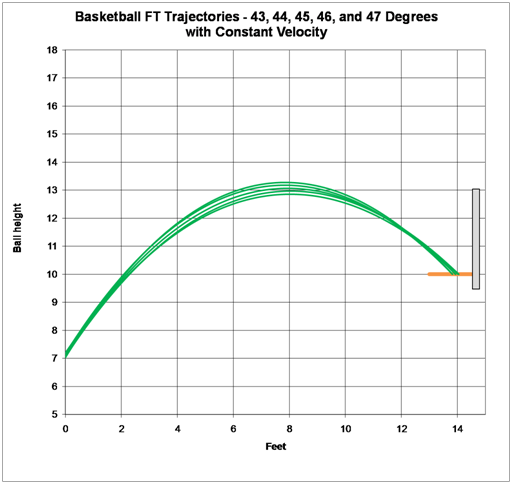 The chart below shows where the ball travels when a player shoots with the same power at 45 degrees, plus or minus 2 degrees. 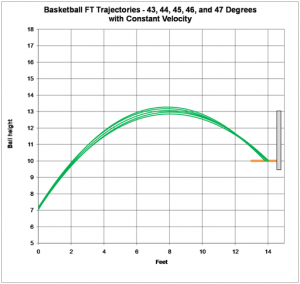 There is a sweet spot at 45 degrees where a player can have a reasonable amount of variation in their shot, but the ball still go the same distance within the basket. This is why all the great shooters shoot the ball at or very close to 45 degrees. About the best a player can control the arc of the shot is plus or minus 2 degrees. The chart below shows where the ball travels when a player shoots with the same power at 55 degrees, plus or minus 2 degrees. 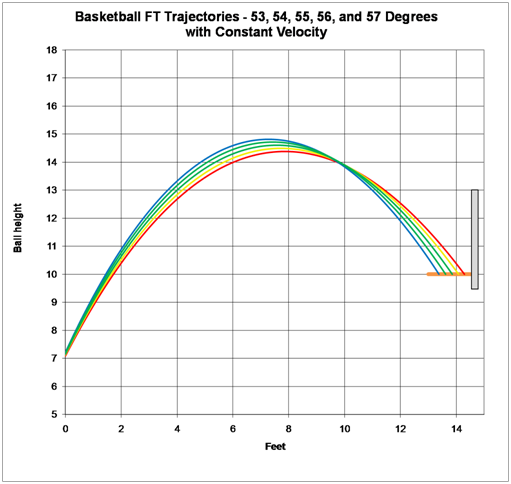 If a 55 degree shooter misses slightly and shoots the next shot at 53 degrees with the same power, the ball goes 7 inches farther, making it miss long. These high shooters will always “spray” the ball from the front of the rim to the back of the rim. This is a problem that they will not overcome with more reps, better mechanics, etc., etc. They are fighting the very laws of physics – a battle they will not win. All great shooters shoot the ball deep in the basket. The chart below outlines the shooting percentage of a typical shooter based on their average shot depth in the basket. As you can see, a shooter will make the most shots at 11 inches deep in the basket. There are so many shooters that are losing 20 to 25 percentage points just because they aren’t shooting the ball deep enough in the basket. The Coaching Toolbox has hundreds of resources for coaching basketball including basketball practice, basketball plays, basketball drills, basketball quotes, basketball workouts, basketball poems, and more! Great stuff. As an ex-science teacher/coach I am always looking for data driven instruction. This might be why I do not like shooting machines (ie Gun/Shoot Away) that put nets around basket. It appears to me that the nets make players shoot the ball too high. Agree? Any studies regarding shooting machines?